Mid-Life Cruising!!! 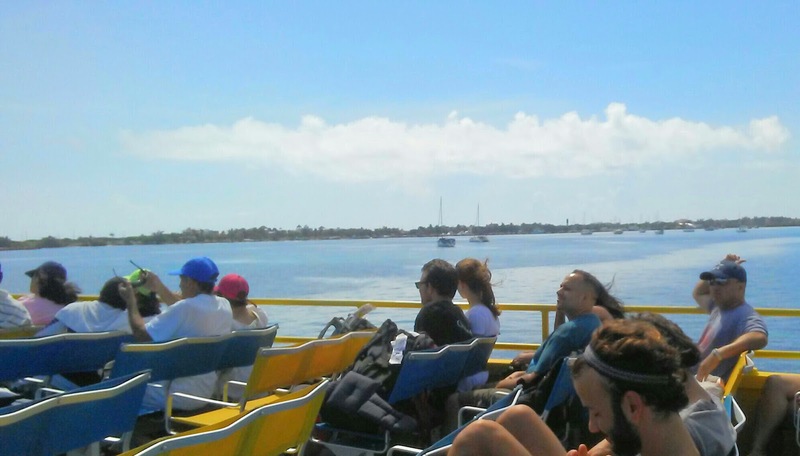 : Ferry Ride & Hotel in Isla Mujeres! 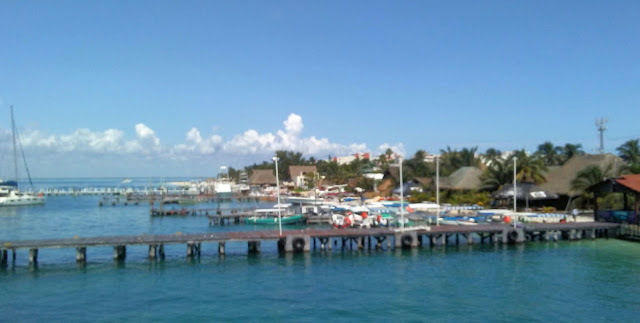 Ferry Ride & Hotel in Isla Mujeres! 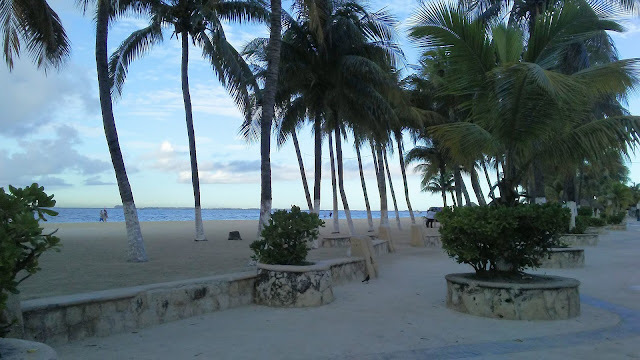 When Ken & I took a day trip to Isla Mujeres about 16 years ago, we didn't know anything about this tiny island. We were visiting Cancun, Mexico for the first time and stumbled across this place only because we had wanted a boat ride and booked a tour. Although the tour kept us mainly on the beach, we were able to see enough of the "Island of Women" to know that we wanted to come back and stay on the island someday. We finally had that "someday" on the morning of September 10th, as we rode the ferry from Cancun to Isla Mujeres for a 3 night stay! 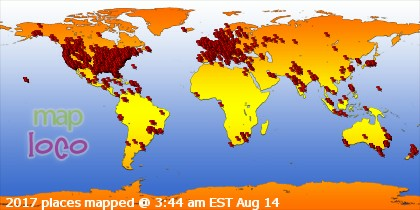 Let me back up and mention where we stayed in Cancun when arriving late the night before. We stayed at a hotel in downtown Cancun that was right across the street from the ADO bus station. If you're not familiar with the ADO, it's a very nice & inexpensive bus that you take to various parts of Mexico ... including from the airport to Cancun and to Playa del Carmen. 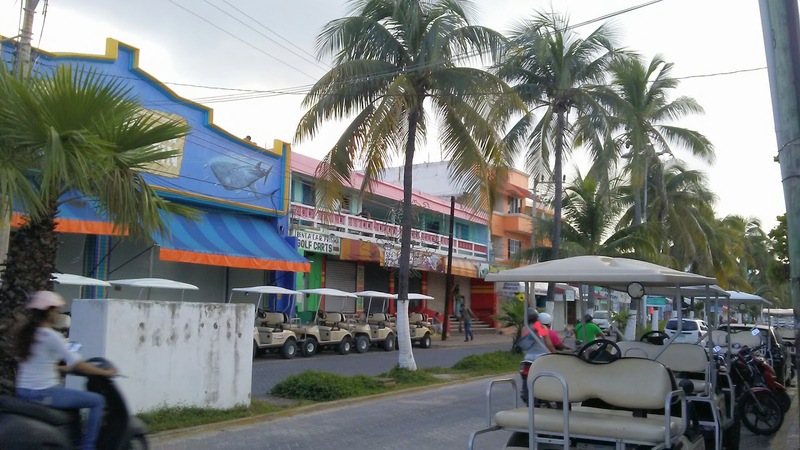 We first took the ADO when visiting Playa del Carmen two years ago, and at $4 a person it's much cheaper than a taxi! Getting picked up at the ADO airport terminal and being brought right across the street from the Hotel Plaza Caribe couldn't have been more convenient. The hotel was only about $50 and the grounds were beautiful! There were peacocks, parrots, lush green gardens and a pretty pool area. Although the bed was hard, the room was clean & we'd definitely stay here again when staying in Cancun for just one night. A very short taxi ride to the UltraMar ferry and we were off! The ferry runs every half hour and the ride takes about 15-20 minutes. We enjoyed the ferry ride, as the water is gorgeous and we love being on a boat any chance we can get. 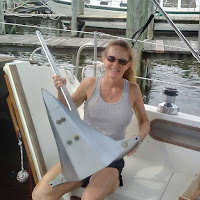 We recently rode the Dauphin Island ferry while visiting Pensacola, and we often ride the ferry across the Mississippi River and back in New Orleans. We were lucky enough to have a local guy riding the ferry ... with a guitar! He started jamming for us and we were happy to give him a tip. This was the perfect way to start our vacation .. nothing like a lil "Guns N' Roses"! Here's a lil clip of his jam, which doesn't sound near as good as he did. Also notice Isla Mujeres in the distance! While riding the ferry, I hoped that the island hadn't built up too much. We were wanting an "island getaway" and I didn't wanna see one Starbucks! I remember how disappointed I was when I first saw Honolulu. Luckily, Oahu did have many beautiful areas on other parts of the island. Anyway, Isla Mujeres did not disappoint! The island is full of "mom & pop" businesses and we didn't find one franchise ... no McDonald's, no Starbucks and very few tall buildings. The picture below shows one of the first sites of Isla Mujeres, next to the ferry dock. Below is the main street, which runs along the South shore and where the ferry dock is located. You can see all the golf carts! There's also a beautiful beach just past the boats shown in first picture ... this is the South shore, which leads West to the beach of Playa Norte. 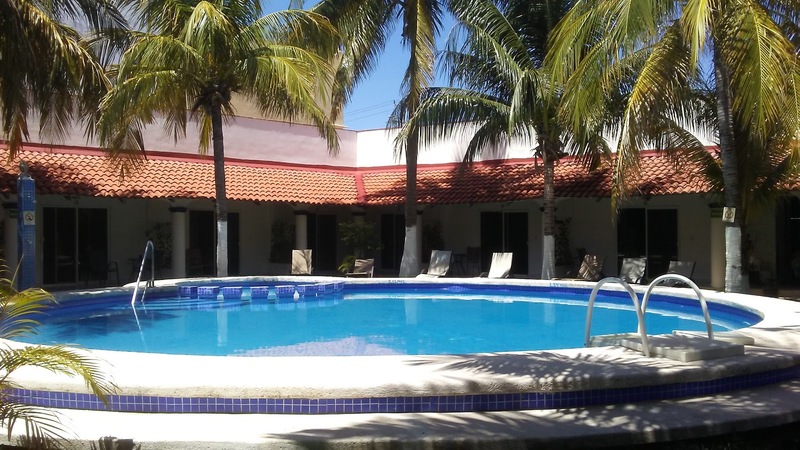 It was a short walk to the Plaza Almendros hotel, which is located on Hidalgo Avenue. 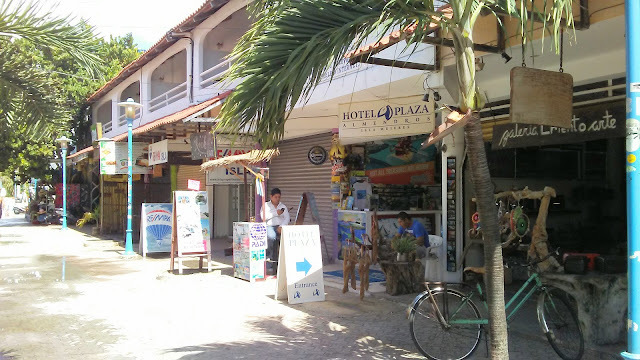 We were pleasantly surprised to learn that we were staying on one of the main streets of the island ... in the middle of restaurants, bars & shops and just two blocks from Playa Norte beach. 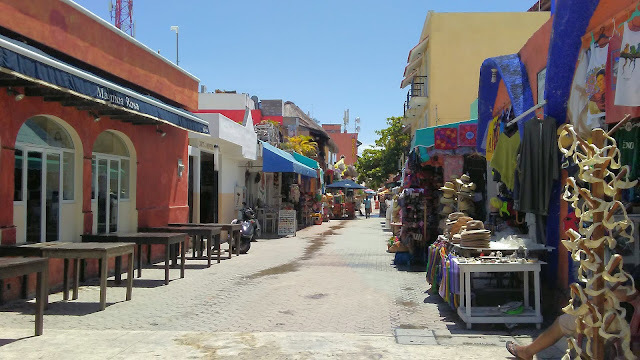 This area of Isla Mujeres reminded us of a little French Quarter, but much cleaner and cheaper ... with beaches! Evidently, we visited during the "low" season, so our room was only about $55 bucks a night! We also learned that our hotel was one of the few with a swimming pool. I guess that's why we wound up here, because we wanted a place with a pool for some down time. It was nice to take a dip in the pool after a long day! We'd stay here again & recommend this lil hotel, but don't expect anything luxurious. The bed was a bit hard and we had to buy bottled water for brushing our teeth and drinking (everywhere we stayed during this trip), but we did have a tiny kitchen area with a refrigerator and the room was clean. What more do ya need?! After getting settled into our room, we explored the island ... stay tuned! The hotel looks perfect, especially for that price! I think all the ferries have the guitar player, though; ours did, when we went on a day trip to Isla. Good way for a local to make some pesos. :-) It definitely added to the mood, I agree.